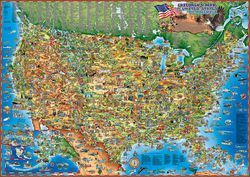 Kids Map of the United States - Dino's U.S. map for kids is a colorful caricature map loaded with cartoon images relating to each state. The state nicknames are listed - for instance, Washington is the "Evergreen State" and Hawaii is the "Aloha State". All the images are cross referenced to a list by state, and common marine life is shown in the ocean areas. Kids will spend a lot of time looking at this map and learning bits of American culture! Laminated.